Omwabini is a registered-1000342-Kenyan Community Based organization working to approach issues relating to poverty and AIDS through simultaneous initiatives directed at individual families, community groups and communities as a whole. Omwabini is a name derived from local Luhya language in western Kenya meaning “a Rescuer”. The objective of Omwabini is to work with orphaned and vulnerable children (OVC) to rebuild their lives and give new opportunities for health, growth and sustainable progress to children and child-headed families who have lost parents to disease and poverty and now face futures of continued poverty, neglect, and struggle with little or no opportunity for change. 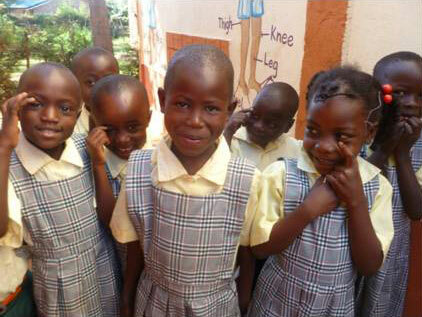 The mission of this program is to work with the orphans and orphan-headed families in Western Kenya. Our vision for these widows, orphans, families and communities is that each may have the ability to sustain healthy living conditions, provide for their own needs, increase their own opportunities, and to continue sustainable progress and change. Omwabini has been working in Western Kenya implementing programs and projects aimed at serving orphaned and vulnerable children since 2002. Since beginning our efforts, Omwabini has worked with over 1,000 impoverished, orphaned and vulnerable families and has tremendously expanded over the past 3 years through partnership and support from Set Free Ministries/Steadfast Foundation from the US. After their parents die the orphaned children are usually left with very little to sustain them as most of the families resources have been exhausted during their parents’ illness. Often times five to eight or even more children ranging in age from toddlers to 16 years of age, are left to provide and care for themselves and each other as their living conditions deteriorate. The traditional social fabric and social/familial safety nets found in Kenyan culture have broken down and been overwhelmed by the sheer number of orphans left behind by parents dying of AIDS and other poverty-related diseases. Prior to the HIV/AIDS epidemic, Kenyan families and communities had the potential to provide a safety net to families suddenly stricken by parental death. The orphaned children could be supported or absorbed into the families of the parents' brothers, sisters or close community members when tragedy struck. Children were able to recover from their loss through the support of their extended families and communities. The unprecedented scale and scope of the AIDS epidemic and the basic poverty found in Western Kenya has left so many families affected that traditional familial support systems have been overwhelmed for a decade and are no longer giving support to orphaned and vulnerable families. The resulting situation in Western Kenya is that orphans find themselves having to scavenge for food, shelter and struggle by every desperate means possible to meet the needs of themselves and their siblings. The goal of Omwabini’s Orphan Program is to meet the immediate nutrition requirements and basic living condition needs of these families. After food, clothing and shelter needs are met, we provide these families with the skills, tools, education and the other resources necessary to begin on a path toward sustainable, healthy, and hopeful lives.